Archives for January 16th, 2018 | SmashToast, Inc.
At one section of Google’s giant outdoor booth at CES was an impromptu, carney-style one-man show, with a guy wearing dark sunglasses and a white Google Assistant jumpsuit loudly and enthusiastically giving away free electronics one by one to a snaking line of gawking tech-show goers. “He got a Google Home Mini! Let’s get a picture, boss!” he yelled out as I walked by on Thursday. 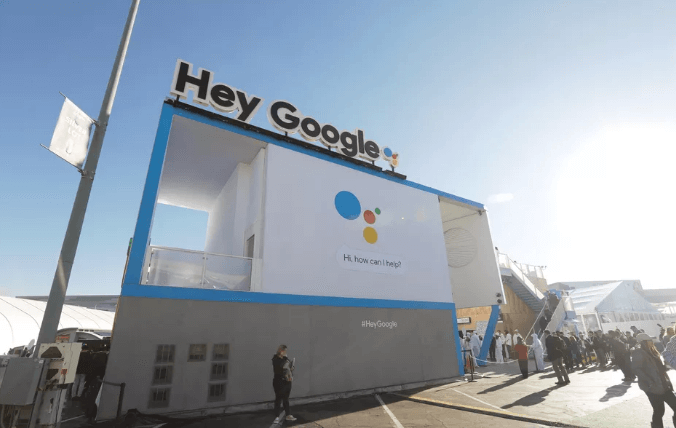 This one booth bro embodied Google’s efforts at CES 2018, with the search giant making a rare and splashy appearance at the world’s largest tech show. The company was working to drum up attention for its Google Assistant voice helper as it tries to catch up to Amazon’s Alexa, the dominant force in voice-controlled smart speakers. That blow-for-blow fight between Amazon and Google highlights the tech industry’s expectation that voice assistants will play a much bigger role in your digital life this year. Executives from both companies at CES talked about bringing their voice assistants to many more places like cars, earbuds and office meeting rooms, so your voice assistant can seamlessly be available to you anytime and anywhere — apparently even on the toilet. So far, voice assistants have built up a fanbase as controllers of the smart home, helping people play music or operate their connected lights. The challenge will be whether these assistants can effectively transition into other places. That test is already playing out in phones, with Apple‘s Siri, Alexa and Google Assistant already available in oodles of handsets, but results have been mixed. Samsung is also working to bring its assistant Bixby into its TVs and appliancesthis year. Siri, meanwhile, was wholly overshadowed at CES and is in danger of falling well behind the pack. With so many companies working to add voice assistants into their products, Hafsteinsson said Google wanted to come to CES — even though it’s avoided a public presence at the show in past years — to show its support for the growing Google Assistant ecosystem. In 2018, he said, Google will work to make its assistant more conversational so it’s easier to use, more capable and, with the help of Google’s partners, more nearly ubiquitous. “When you think about what’s happening this year, we’re trying to make the experience richer without making it more complicated,” Hafsteinsson said while gesturing to one of the smart displays. At the show Wednesday, at the Sands Expo and Convention Center, Amazon’s Rabuchin discussed a similar game plan for the coming year. “We’d love Alexa to be moving with you,” he said in a corner of a large private meeting space Amazon set up at the show, which included a handful of glass displays filled with Alexa-powered gadgets. The e-commerce heavyweight is inching closer to that goal. Rabuchin said that Alexa is integrated into over 4,000 smart-home devices from 1,200 brands and that more than 30,000 Alexa skills (Amazon’s term for voice apps) are now available. He added that the Alexa economy is showing signs of strength, with some Alexa developers making “over six figures” through checks Amazon pays for the most popular skills. He conceded that there are hurdles to bringing Alexa into more areas of your life, but added that the company is thinking about how to make Alexa useful in each of those different places. The assistant won’t do the exact same things in your car as it will on your personal computer or in an office space. One thing Rabuchin said isn’t changing soon is Amazon’s ads policy, which strictly limits advertising on Alexa. He batted down reports this month that Amazon was talking to brands about bringing more ads to the assistant.